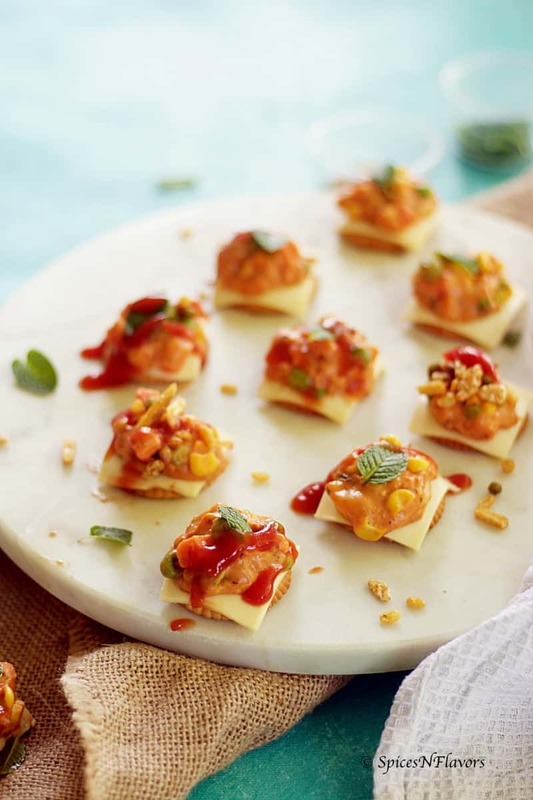 Cheesy Monaco Bites is a simple, easy and quick to make starter recipe that will surely impress your family and friends. Involve your kids in this fun activity; I am sure they will enjoy it too. 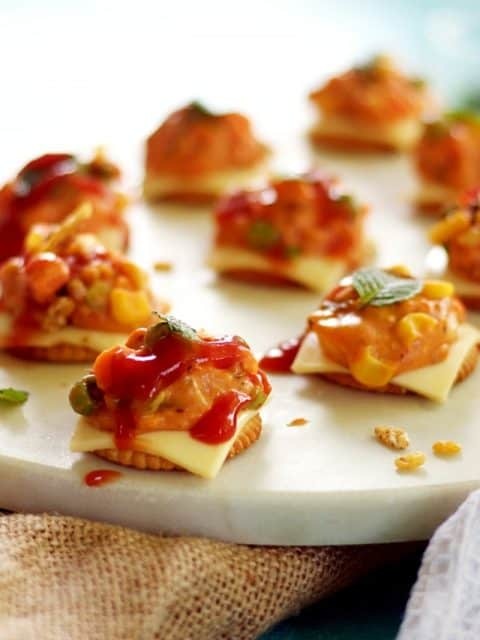 Cheesy Monaco Bites or Monaco Biscuit Party Topping as the name suggests is an easy and cheesy starter recipe. This has Monaco biscuit as the base and then a cheesy vegetable loaded topping on top. The combination of salted biscuits with cheese is always a win win amongst kids. Yes adults would love to indulge too.. If only I were in my teens I would have enjoyed it guilt-free. When I had this cheesy monaco biscuits I was transported to my childhood days. I have always loved to eat cheese slices. But of course once a while everything is ok right!! Like last week I had this eggless chocolate cake made in one pan with no milk or butter. To flavour this Vegetable topping I have used pizza as the base as in pizza flavouring like dried oregano, pizza sauce, paprika and chilli flakes. I also have a homemade pizza sauce recipe on the blog if you would like to see. I make use of this sauce in not only making pizza but also like now in these Cheesy Monaco Bites. I had even made Pasta Pizza once as in used pasta as the base. You can even try the same recipe with Maggi Noodles. I sometimes use this in our Indian curries too; adds a different flavour. Balancing work and family is getting so much difficult these days..
And that is why such recipes are always handy. This Cheesy Monaco bites would take hardly 15 mins of your time. In fact you can even involve your kids in this fun activity. That is the one thing I am trying to do these days.. Come up with simple everyday recipes with a twist like in my previous Rava Upma Cheese Balls. Make some Rava Upma for breakfast and with the leftovers make Cheese balls for your evening snack. Cool right!! Or like this 15 mins No Cook Instant Barfi is perfect for this festive season. Or this 5 mins DIY Pistachio Chocolate barks is a great gifting idea too. I had made this as a return gift for my daughter’s Little Krishna theme first birthday party. 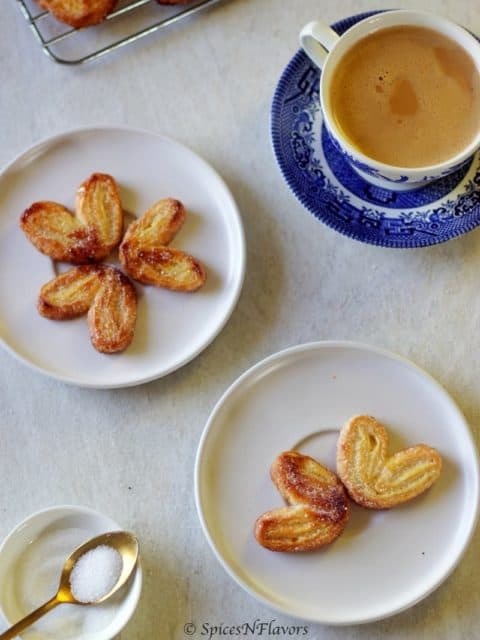 Are you liking these kind of recipes? 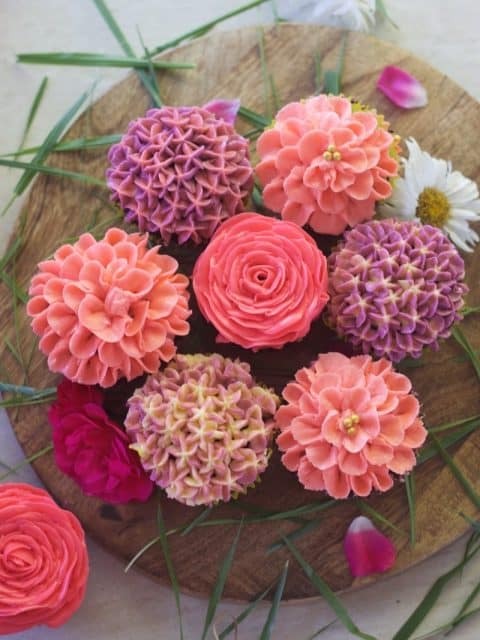 Comment below and let me know so that I know what exactly are you looking for and blog about those recipes. What is so special about this Cheesy Monaco Bites? 1. These are super easy to make and assemble; would hardly take any time. 2. It is a fun activity to do with your kids. Involve them to arrange the biscuits. But yeah do not scold them if they eat it right away.. Can’t blame them it is that yum!! 3. You can just add any flavours to the veggies. And even can change the veggies to your family’s preference. 4. The topping can be made ahead of time and everything can be put together right before guests arive. 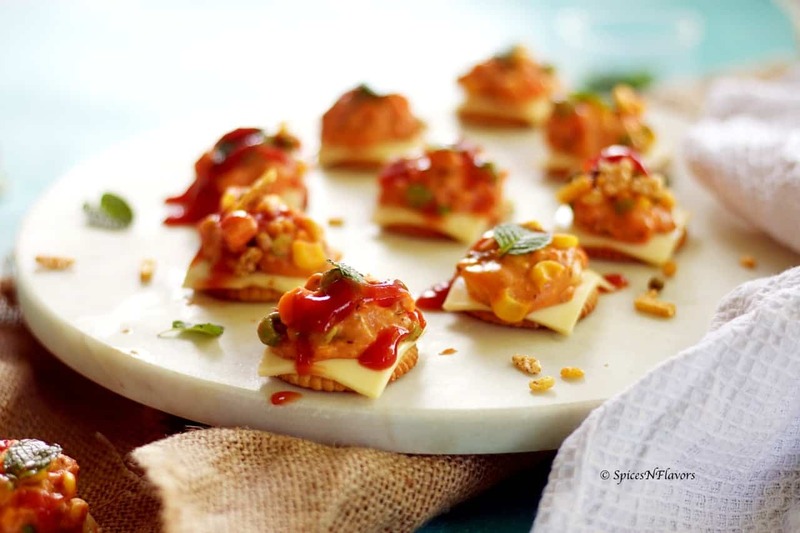 These Monaco Cheesy Bites are basically salty biscuits, loaded with the goodness of veggies and with cheese kids would gobble these up in no time. A best after school snack too.. 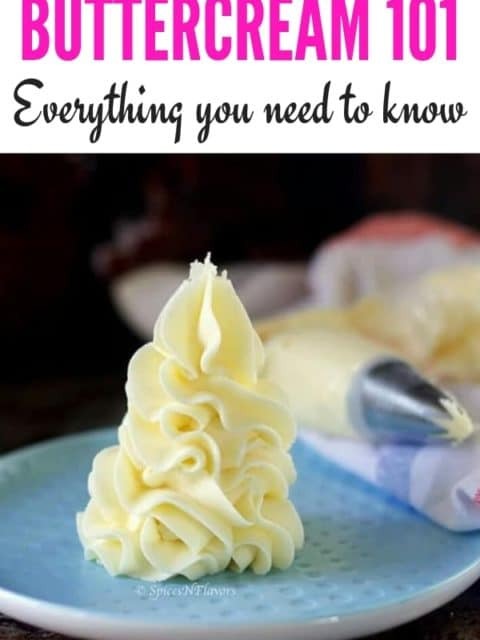 The base for this is White Sauce or what we call “Roux” in culinary terms which forms the base for many other recipes like Pasta, pie filling etc. Season it up to your liking and you are in for a treat. If you like this recipe then do tag me, tweet me or instagram me. I would love to follow you and your posts. 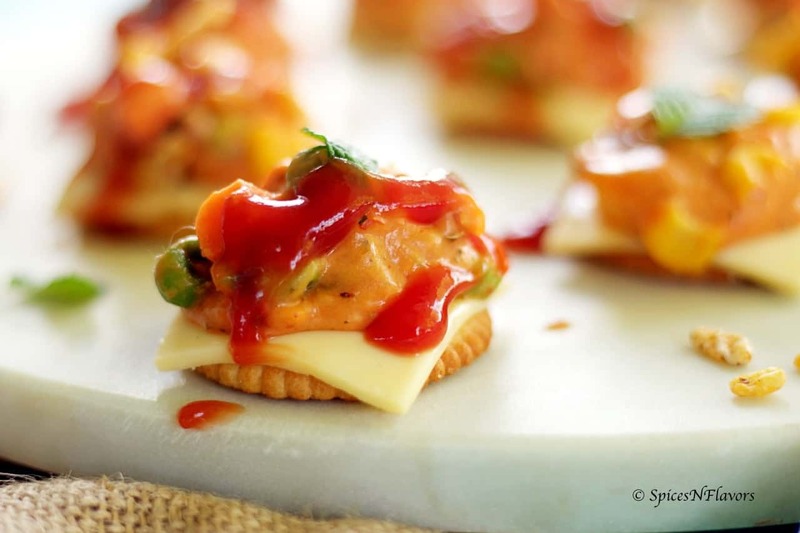 Cheesy Monaco Bites is an easy and simple to assemble starter recipe that is loaded with veggies and is perfect for any occasion. Heat up the butter in a pan and the mixed veggies. Cook it until soft around 2-3 mins. Add the maida, stirring continuously cook until the floury taste goes around 2 mins. Stirring continuously add in the milk. You will see that the mixture thickens quickly. Switch off the gas and add in the oregano, pizza sauce, paprika powder and almonds. Stir to mix everything. Add in the grated cheese and mix everything well. Top it off with some chilli flakes to suit your family needs and also if you find that it is too thick just add in some milk to adjust the consistency such that it is eay to spoon later. Refer my video recipe for clear understanding. Let it cool a bit and transfer to a bowl. Take a monaco biscuit. Place on quartered cheese slice on top. Spoon some prepared veggie topping on top. Garnish with mint leaves or farsan. Serve it with tomato ketchup if need be. And thats it for your Monaco Cheesy Bites. 1. 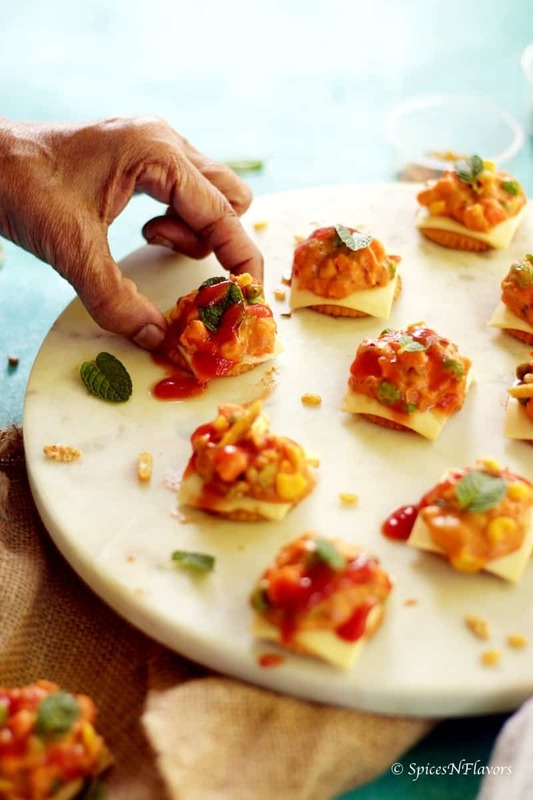 Refer my video recipe for clear instructions – Cheesy Monaco Bites. 2. I have used frozen veggies here you can use fresh too. Some other veggie combination like Boiled Potato and Paneer with Mint chutney or Onion and Capsicum with some dip and chutney can also be used. 3. Instead of paprika powder, chilli powder can also be used. 4. Assemble the biscuits just before serving or else it would turn soggy. In fact ask your guests to help themselves so that they can decide what they like. 5. I have not added salt to the veggie topping that is because we are using cheese which also has some salt in it and we are using salted biscuit as the base so adjust accordingly. 6. I had some topping leftover which I used as a sandwich stuffing the next day. That tasted good too. 3. DIY 5 mins Pistachio Chocolate Bark.